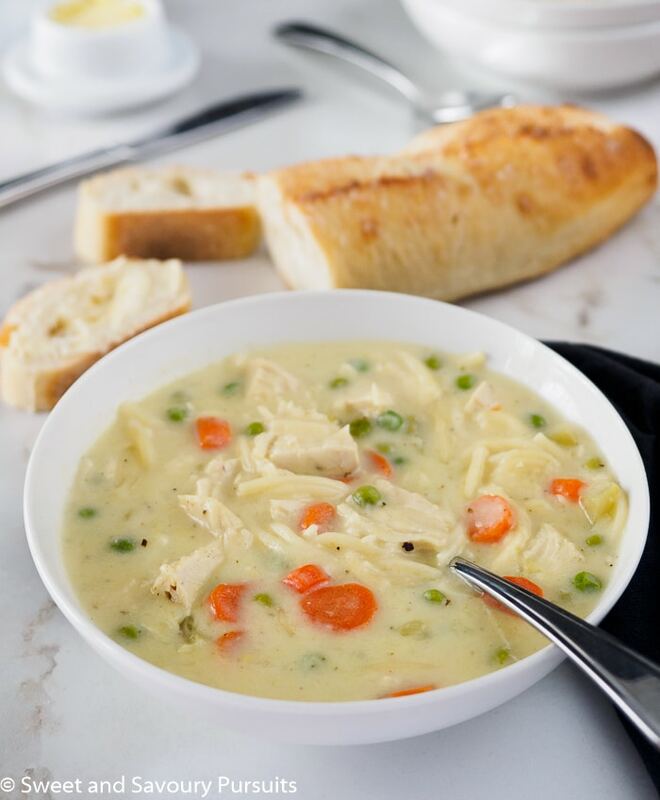 Delicious, comforting and filling, this homemade creamy chicken noodle and vegetable soup makes a nice change from the classic chicken noodle soup. I made this creamy chicken noodle and vegetable soup on a cold snowy day, it was just what I needed to forget about the storm happening outside. 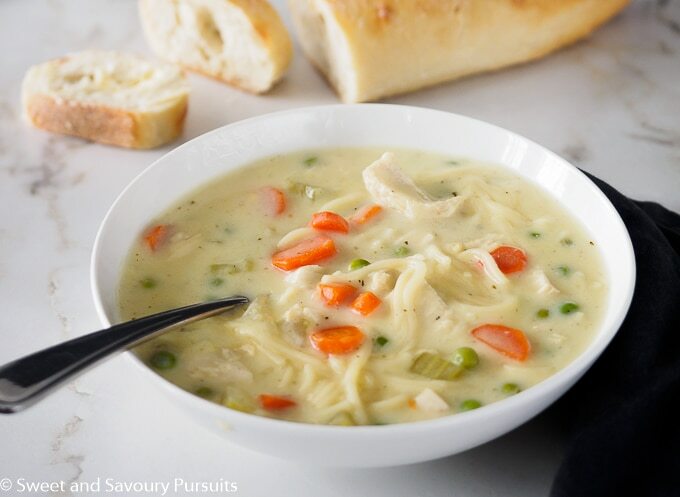 This delicious and hearty soup is full of all the savoury vegetables, chicken and noodles that you find in a regular chicken noodle soup but is also incredibly creamy. I’ve been wanting to make a creamy chicken soup for some time now, so when I saw this recipe for Creamy Chicken Noodle Soup over at Cooking Classy I knew it was time I tried it. This soup is really easy to make and doesn’t take much time at all to prepare, especially if you have leftover rotisserie chicken and some ready made chicken broth. I didn’t have either, but I did have some chicken breasts in the freezer, and since I had plenty of time, I cooked the chicken in water along with some aromatic veggies and spices, so at the same time as I was cooking the chicken I was making some homemade chicken broth. The soup came out so delicious that I’m already planning my next creamy soup meal. The soup makes great leftovers, but you might want to thin it out slightly with more chicken broth or water when reheating. Just add enough broth until you have the desired consistency. Enjoy! If you make this recipe be sure to take a picture and share it with me on Instagram by tagging #sweetandsavourypursuits, I love to see your photos! Homemade recipe for a delicious and easy Creamy Chicken Noodle and Vegetable Soup. Salt, pepper, dry oregano or thyme to taste. Add onion, celery and carrot and cook stirring for about 3 minutes, add garlic and cook for one more minute. Add salt, pepper and dried oregano or thyme. When soup is boiling add uncooked noodles and cook for approximately 8 minutes. Meanwhile in a small saucepan, over medium heat, melt butter and add flour, stir the mixture constantly for about 3 minutes. Slowly add the milk to the flour and butter mixture, whisking constantly until the milk comes to a boil. Pour the creamy milky mixture into the soup, stir, reduce heat and simmer until slightly thickened, about 2 minutes. Stir in the shredded chicken and peas and simmer for 1 more minute. Adjust seasoning, add a dash of freshly grated nutmeg and a sprinkling of chopped parsley if desired. I’m glad you like it. I would be interested to know how it turns out with soy milk. Let me know if you try it! Ahhhhhhmazing! I left out the pasta and threw in some gnocchi for the last 5 minutes and it was phenomenal! So happy to hear that, love the gnocchi idea, I think I may try that myself! Looks so delicious, I love chicken and noodle soup. Thank you for this great recipe. Yum, this looks so comforting and tasty! Mmm… looks so welcoming for a chilly winter day! This recipe is definitely on my “must make” list. Hi Nancy, so nice to have you back here! If I remember correctly we seem to like the same foods, so I’m sure you’ll love this soup! I’ll be popping by your blog soon to see what you’ve been cooking. Take care! wow…i m already craving for this…cant wait to try this at home…. I’m sure you won’t be disappointed, it will be well worth the wait! What a delicious-looking soup! It sounds wonderful! Such a nice change to have a creamy rather than brothy chicken noodle soup. Just a touch richer. I am going to make this. Thanks Louise! Hope you enjoy it as much as I did. Really a gorgeous soup. I just love creamy soups and it’s been a long since I’ve had cream of chicken. Must try this. Thanks Suzanne! You really should, I don’t know what took me so long to make this soup, it’s so delicious.